How To Better Use Your iPhone 6s. The iPhone 6S comes with plenty of improvements over earlier versions of the iPhone. Most of the new features are intuitive enough that you can use them without learning any new skills. If you want to make the most of your new phone, though, you need to delve into the details a little. Start by learning these four tips. They'll make you appreciate your iPhone even more than you already do. 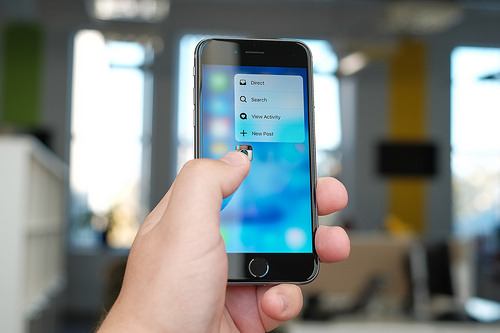 3D Touch can give you better control over your smartphone, but you'll have to learn a few things before you can make the most of this feature. One of the most useful aspects of 3D Touch is that it lets you view menus on your home screen. For instance, instead of opening your camera app and selecting the selfie feature, you just place your finger on the camera icon, wait for the menu to appear, and select Take Selfie. 3D Touch also lets you preview messages and links before you decide whether you want to open them. If you have several emails from the same person, and you're not sure which message you need to open, you can press your finger on any of the emails to see a preview. If it's not the message you want, lift your finger off the screen. If it's the one you need, swipe up. The iPhone 6S comes with a 12-megapixel iSight Camera, so you'll want to take a lot of pictures with it. What you may not already realize, though, is that you can use Live Photo to make your pictures even more interesting. When you take a picture with the iPhone 6S, the camera records 1.5 seconds of activity before and after you snap the photo, which essentially gives you a three-second video. You don't have to use the extra footage, of course, but it's nice to have. You won't know how much you appreciate this feature until you start using it. Suddenly, you get more than just a photo of your child's face covered in birthday cake. You also get the moment before and after she smashed her face into the icing. Siri has learned a lot of new skills since her debut in 2011. With one of her most recent developments, you can access her even when your phone is locked. This makes Siri more useful when you're driving, cooking, or doing anything else that prevents you from picking up your iPhone. What's really cool is that Siri won't listen to just anyone. Once you record yourself saying “Hey Siri,” she'll only respond to your voice. That makes this feature both useful and secure. Having access to Wi-Fi means you can stream content and download videos without using your cellular data. Some Wi-Fi networks, however, aren't very strong. It's nice that your local café lets you use its network, but can't they upgrade to something that's actually useful? Wi-Fi Assist makes up for slow, weak networks by letting your cellular data help. You obviously don't want to use it all the time. Relying on Wi-Fi Assist too often could lead to some surprisingly expensive data charges. It's extremely useful, though, when you need it. The original version of Wi-Fi Assist didn't concern itself too much with how much data you used. Apple has realized that mistake and updated the app. Now, you have an easy way to see how much data you consume. That should help you keep your bill under control. If you're worried about using too much cellular data, you should turn off Wi-Fi Assist when you don't need it. Apple's designers constantly look for new ways to improve their mobile devices. The iPhone 6S stands out as one of their finest achievements so far. With these and other great features, it's hard to imagine what Apple will come up with next.